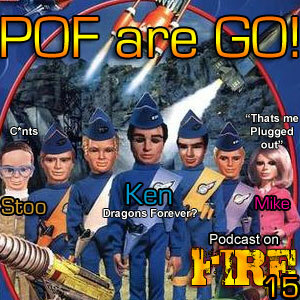 Cast From The Past: Podcast On Fire 15 – Thunderbirds are Go? The next Cast From The Past (a series of shows lost from our iTunes feed and website) from 2008 features Stoo, Kenny B and Mike Banner talking last movies watched such as the unexpectedly terrific The Four Invincibles, the always terrific Disciples Of Shaolin and Mike raging over all the movies Ken have not watched. Also, the POF-team gets their Thunderbirds counterpart explained.